With the Galaxy S8 pushing the boundaries of the display by extending the bezels on the device it set the way for other manufactures to follow suit. Samsung followed with the Note 8 and even Apple got into the game with the iPhone X. The subtle differences between the Samsung and Apple implementation of a bezel-less display saw Apple opt for a top notch to house the front facing camera and various sensors, while Samsung extended the top bezel the entire way across the device. One concept that has surfaced suggests the Samsung may take a design cue from Apple when it comes to the Galaxy S9 and reduce the bezels of the device even further with the top cutout. We’ve seen this design on the Essential Phone as well where the camera is cut out from an otherwise edge-to-edge display. 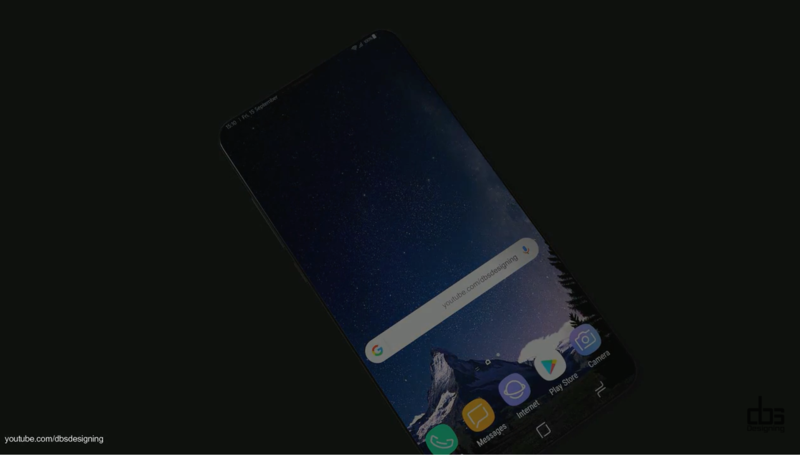 The latest Samsung Galaxy S9 concept comes from the YouTube channel DBS Designing that sees the top and bottom bezel almost completely eliminated. At the top of the Galaxy S9 there’s a small cutout to house the camera, speaker, iris scanner, and other sensors. The iPhone X cutout is more pronounced than that of the Galaxy S9 concept but arguably the cutout on the iPhone is that size for a reason given the available technology it has to pack in that small space. Other key points of the Galaxy S9 concept are the inclusion of the 3.5mm jack that the designer believes Samsung will retain. The concept also has dual front-facing cameras with a 18:9 aspect ratio Quad HD+ Infinity OLED display. The device is said to have 6GB of RAM, 128GB of internal storage and will be the first device to run the upcoming Snapdragon 845 SoC. We’ve heard previously that Samsung may expedite the arrival of the Galaxy S9 to combat sales of the iPhone X that may see a January or February arrival, a few months before when it is actually expected. While there’s no doubt Samsung will continue to push the boundaries of what is possible with display technology, it could be very possible Samsung reduce the bezels even further to mimic the design of the iPhone X. However, I think reducing the bezels to the amount shown in the concept simply isn’t possible with the available technology and the size of the components needed in that notch.